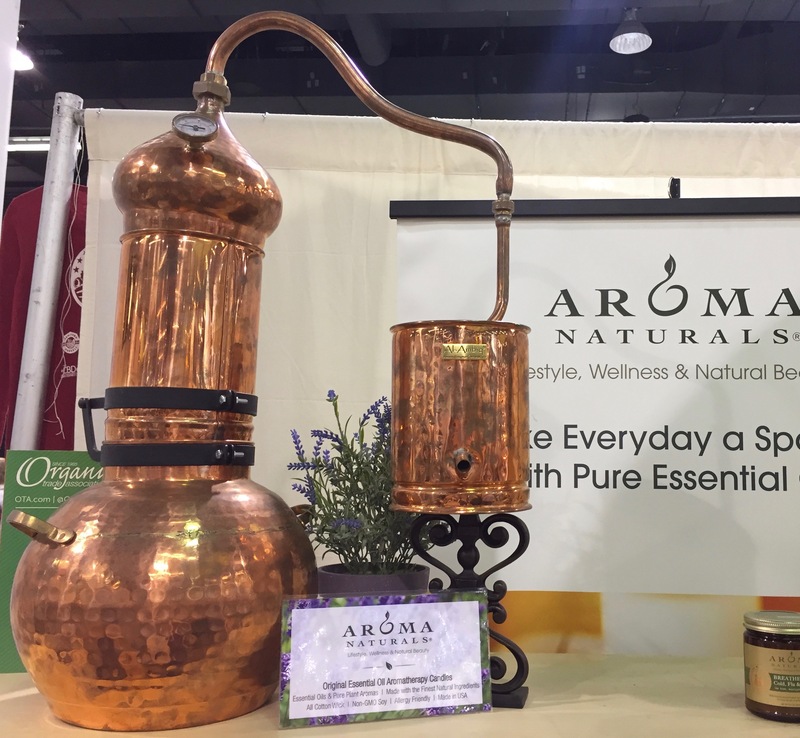 Expo West, which is the largest natural products trade show in America, attracts all manner of natural manufacturers and retailers. I have attended off and on for the past 15 years, and am always excited to see more and more aromatherapy suppliers. 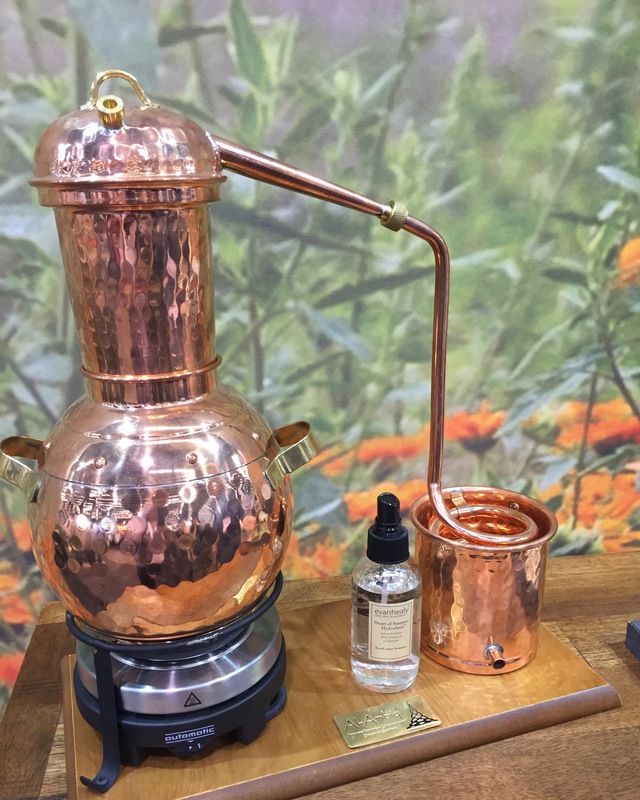 This year was quite interesting because essential oil product creators were getting back to their roots and showing off distillation equipment in their booths. I counted not one but three gorgeous alembic stills that were on display. According to English Oxford Dictionaries, an alembic is “a distilling apparatus, now obsolete, consisting of a gourd-shaped container and a cap with a long beak for conveying the products to a receiver.” I have seen a few historic alembic stills, but the use of them is far from obsolete. The art of distillation is making a resurgence, and copper or glass alembics are readily available. Essential oils are extracted primarily through distillation, a process that has been around since the 1st century. During this time, alembic distillation was perfected to become the precursor to our current method. Many liquids have been produced through distillation, including distilled water and moonshine, but essential oils were not created until hundreds of years after the process was made more exact. I’ve been fascinated with essential oil distillation ever since I saw a live demonstration. I first witnessed lavender being distilled at a festival in the Pacific Northwest. A massive amount of plant material was placed in a large stainless steel device and within a short period of time the wonderful scent of lavender was pouring off of it. This experience made me want to get my own still, but it required a lot of plant and controlled equipment. Since that initial distillation, I have seen countless others using a variety of stills and plant matter. Seeing these beautiful copper units renewed my interest in doing my own distillation. Small ones can be purchased online, so I am drooling over a home-sized version that will allow me to create hydrosols. I plan to do my part in keeping alembic distillation from becoming obsolete.